Digital Forsyth | Winston Town Hall. Home › Photos › Winston Town Hall. Winston Town Hall. 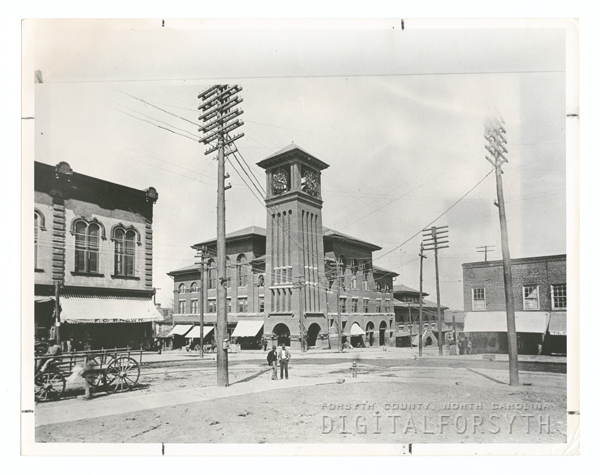 The town hall was located on the northeast corner of West Fourth and North Main Streets. I have looked at this photo for years trying to determine its true date- never being happy with the date I was given. What I have come up with is that it was taken while the second courthouse was being finished- There is no grass on the courthouse lawn yet, and the sidewalks no doubt had to be constantly swept.